One thing that quickly gets lost in the gaming industry is a sense of auteurs, or a sense of ownership to a series or game that one’s made. When a team or someone with the creative drive for a series leaves, it has a deep impact on the upcoming games. We’ve seen that with the Bioshock series, with Bioshock and Bioshock: Infinite being developed by a different team than Bioshock 2, to Bioshock 2’s detriment. There was also a similar case with Dark Souls 2, although not as drastic. The game was still produced by mainly the same team, but with a different director(s), and while it certainly wasn’t a bad game, it didn’t feel like a proper Dark Souls game. 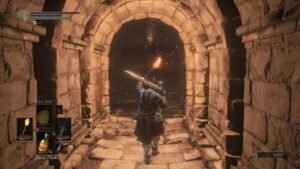 Dark Souls 3 sees Hidetaka Miyazaki back at the helm of the Souls series, possibly for the last time, since he’s stated that this will most likely be the last Souls game he makes. And man, does the game benefit from his direction. If Miyazaki does intend to go down with his ship, he’s sending it down to the tune of Back in Black with fireworks coming out of every window. Dark Souls 3 feels like a collage of the past four games in From Software’s repertoire: Bloodborne, Dark Souls 1 and 2, and Demon’s Souls. It doesn’t take everything from one source; rather, it takes the best of each, rubs them together, tightens the screws, and creates something functioning less like a congealed glob of concepts, and instead more like a well-oiled machine. Aspects from each game have been tweaked to some extent, and come together in fantastic form. As such, whenever there’s some mechanic taken from one specific game, I’ll put it in parentheses. It’s cool to see just how integrated the past seven years of development turned out, and it’d be a shame to not emphasize that. It’ll be easier to start off with what hasn’t changed with the game. 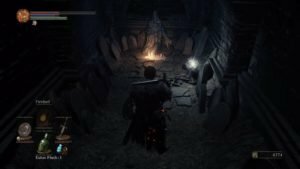 Dark Souls 3 still has your basic right-hand, left-hand, backstab, expansive world, background plot, and difficult boss fights. Souls are still used as your leveling resource, cash, and still tends to be more easily lost than the fish from Space Quest 6 (which is probably a reference now lost from the world). It’s also becoming very much like Mario’s level design with its plains, ice, desert, castle, etc, level design. There’s some castles and cathedrals. There’s the bog and marshlands that has a toxic floor. There’s the sewer area, the ice kingdom, the gardens filled with really powerful knights, ad nauseam. The enemies and bosses keep the areas feeling fresh and different from the last cathedral, bog, sewer, ice kingdom, that the player found themselves dying in, though. The game sets itself up more hub-like (Demon’s Souls), with Firelink Shrine being your central hub. The game’s also filled again with its typical lore-hunting and background plot-building. For the longest time (minor spoiler), I had originally thought that this might’ve taken place pre-Dark Souls, but reading the item description on a glove clued me in that we’re definitely post-Dark Souls. There’s definitely more Dark Souls than Dark Souls 2, but it does well to include some references from the latter. The hub does a better job at being fluid with its character roster (Demon’s Souls). It does have the error again of having to level up by talking to a lady every time with a four-line sonnet she feels like spilling to you like a political activist trying to get you to sign a petition (Dark Souls 2). The only reason she wasn’t introduced to the edge of my axe is because she levels your character up, and it’s guaranteed that’s the only reason. Talking to certain characters outside of the hub can convince them to teleport to the Shrine, where they can offer services like pyromancy spells or cleric miracles. They also do well to explain exactly just what happened to the world around you, since the time jump makes you feel somewhat like a time traveler, lost to what this future is all about. I set off on my journey as a pyromancer, because they’re sort of an all-around build. They start off with fireball, which gives him some range, but has decent stats for building into a strength/endurance build. I also named him Aaron so I could yell this every time I died. The different skills have just about stayed the same, with a change in how any sort of sorcery or skill is used. A third bar (Demon’s Souls) shows a player’s Focus Points (FP). This contributes to a player’s ability to cast spells, like a sorcery or pyromancy skill. They also can be used to activate a weapon’s unique skill, which is another new addition (Bloodborne). Some skills buff the player’s attacks for a bit, while others might give new attack patterns or dodges the player can use. Accruing more items means a chance at finding an improved skill for the playstyle you’re aiming for, and any extra items can be sold to a merchant at the Shrine for a horridly deflated price, and any extra items can be sold to a merchant at the Shrine for a horridly deflated price. Along with this new player resource is a new type of Estus, which allows you to recover your FP. At the blacksmith you’re able to change the ratio of orange (HP) and blue (FP) Estus flasks to your liking at no cost, which is an odd grace in a world that punishes players for the slightest mistake. 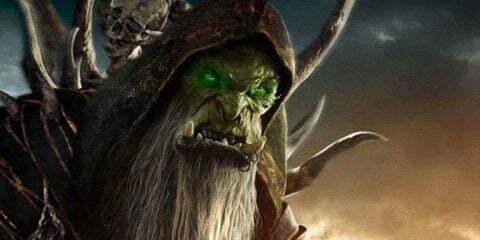 Players relying on sorceries and spells would be hard-pressed to leave without at least two, while some warrior or tank builds might not even want one, opting to just bash through enemies with just orange Estus flasks. One thing that felt off was the consistency of souls. For a long while, enemies were only chucking out a few dozen souls for their deaths. Not saying that I’m some big Souls-cialist and demand that souls just be given to me for living below the souls income line, but there was a definite imbalance in level progression versus number of souls I was collecting. After a certain point, I started picking up more souls than I could count, and then back to a soul trickle. From the get-go, you’re given the ability to teleport from and to any bonfire you’ve lit (Dark Souls 2). There’s definitely an excess of bonfires, though. Defeating a boss will place a bonfire down, only for a hallway or area twenty feet ahead to have its own bonfire. As well, there’s definitely more of a linearity to the overall level design. The individual levels feel much more like Dark Souls, with doors and stairways and elevators opening more of the map and creating shortcuts. But the overall map flows more straight-forward. There wasn’t a point where I thought one area was too hard, so I might go to another area instead and try that out. A consequence of the teleportation being introduced so early on, the entirety of the map continues to stretch out, rather than splitting, to keep the pace up. The game looks gorgeous when loaded. Sometimes, the game decided that it’ll load in some textures at its own pace however, leaving some gorgeously rendered grey polygons and rectangles for a bit before rendering properly. The framerate drops were kept to a minimum, with only one area pretty late in the game feeling only a slight framerate drop, although those on the Xbox One supposedly have it a bit worse. 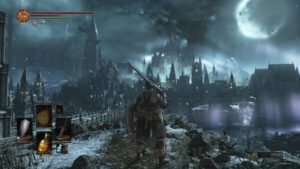 Dark Souls 3 recreates the excitement of looking out into the distance and, eventually, ending up in the places you see in the distance (Dark Souls). What’s truly inspiring is looking out and finding places you’ve already been to in prior games, although which places I’ll leave for you to find. As well, one odd glitch I kept running into, quite literally, was random, invisible walls. They’d be placed in the oddest spots, like in the middle of a room for a few feet, or in the middle of a staircase. This can be quite disconcerting when you’re trying to run out of a room with invisible baddies behind to tow, only to end up looking like a desperate treadmill runner with his pants down. The walls thankfully dissipate after you die or go back to a bonfire, so meeting one isn’t a permanent encounter, but they were still co-conspirators in at least half a dozen deaths. 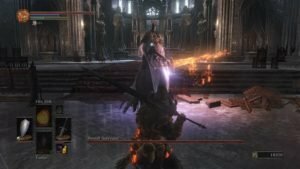 The bosses actually feel somewhat refreshed, even with some of them connected to prior bosses in the first Dark Souls. One niggle is that many more bosses have a two-stage approach, where knocking them down to half health reveals a deadlier, second form with a new move-set to figure out. Or maybe killing a boss only creates a second boss, making killing the first one feel more like a chore than an accomplishment. It really kills the mood to obliterate a boss’s health, only to find that they’re back with full health and more powerful moves, while you’re just down on Estuses. Having this happen somewhat less frequently might’ve actually given then mechanic merit. After the fourth time though, it just became annoying. Another odd point for the bosses is that they all seem to have several high-damaging mid-ranged attacks. Usually trusting in my handy axe, I didn’t notice this until I backed up to heal against one boss, who proceeded to come at me with a flurry of blows that gave me the Ronda Rousey knockout. Spellcasters might want to have a solid backup melee weapon, since many bosses were easier to deal with up-close. Overall, though, the bosses were all varied and interesting, keeping challenge and difficulty well-balanced. With much hype and fanfare, the Souls series finally receives the sequel it deserved, and then some. The gameplay rewards astute players, and those that read the item descriptions and become more aware of their surroundings are rewarded with lore and plot. While the Dark Souls games are marketed as being “hard,” what that really means is that they reward the cautious, thoughtful player and chastise those just looking to push through the game without thought or reason. The player that looks first, keeps their shield up, and attempts to pick up on the clues constantly left around the world comes out on top. So go. Buy the game, say goodbye to your kids, kiss your wife, and lock yourself with Dark Souls 3 for a few hours. For the fire fades, and so, too, will your social interaction for the next few weeks.